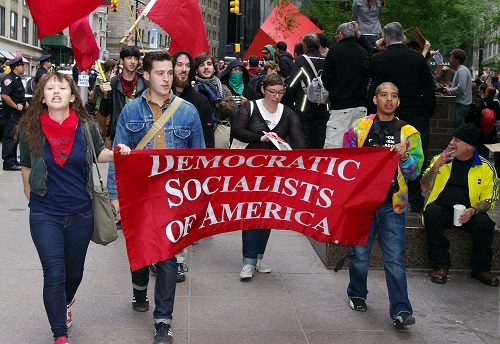 Why do young people throughout the West have an increasingly positive view of socialism? The answer has been ferreted out between the lines of a survey recently conducted for the Charles Koch Institute. Young people’s infatuation with socialism remains one of the most lamented (or celebrated) facts of the cultural landscape – but both sides agree, it is an undeniable fact. Americans under the age of 30 hold a more favorable view of socialism than capitalism, according to a Gallup poll conducted in August. A Wall Street Journal poll from September found that people under age 35 nearly twice as likely to view socialism in a favorable light than senior citizens. One-in-three people under 30 believe the United States would benefit from adopting socialist economic policies, per a survey conducted by Fox News in July. Those with more economic acumen (and gray hair) wonder aloud, why has this come to be? Don’t they see Venezuela? Haven’t young Brits read about Harold Wilson? It certainly helps that young people’s experience with socialism has been constrained to the purely theoretical. Communist atrocities find no place in school textbooks. Socialism is never described as the collectivist economic force that transferred all the means of life – and death – to political elites. For the most part, they neither know nor remember the postwar era. But they do remember the government bailing out financial institutions and other bad actors. The Emergency Economic Stabilization Act of 2008, which established the Troubled Asset Relief Program (TARP), marks its tenth anniversary this year. It earmarked $700 million in bailouts – but economists argue the total federal intervention into the banks reached well into the trillions, in addition to tens of billions for the auto industry. For the anniversary last month, the Charles Koch Institute conducted a poll that found a plurality of Americans believe government should have let bad actors, who were labeled “too big to fail,” go bankrupt. A large majority believe government bailouts create a cycle of financial misbehavior, leading to more government intervention. So far, that tells us nothing about millennials’ embrace of socialism. But drill down into the data, and an answer begins to take shape. People between the ages of 18 and 24, alone, believe the government should have bailed out more companies. They are the most likely to believe the bailouts were intended to benefit the companies’ employees, rather than shareholders or creditors. People 18-34 are more likely to believe the bank bailouts were helpful for the economy – but also to believe that the bailouts harmed them personally. The takeaway? They believe someone else benefited from the policy, at their expense. Furthermore they are the most likely to believe that the bailouts resembled other forms of government subsidies. The government’s job is to bail out those in economic trouble, even if it’s their own fault. They perceive that corporate welfare allows companies to net private profits and collectivize losses. They rightly believe financial leaders bank on the government rescuing them from the folly of their fiscal ways. Government intervention is benign. The political leaders sold TARP and associated policies as necessary for all Americans. Millennials just believed the rhetoric. Government subsidies should be more widely shared to “help” more people. Since they see no distinction between bailouts and other forms of federal spending, they want their share of the benefits. To this day, “Where’s my bailout?” nets 20,000 search results, even with Google’s more restrictive criteria. If banks and corporations receive government bailouts, certainly young people can have free tuition, a guaranteed job, and free healthcare. And that is the road to socialism. The UK had its own series of bank bailouts between 2007 and 2010, with associated losses for the taxpayers continuing to pile up. It is not inconceivable that young Brits learned similar moral lessons. The Left is right to say the budget is a moral document. The TARP bailouts taught a generation of people to disregard the virtues of self-reliance, prudence, and personal responsibility. Thanks to the Charles Koch Institute for bringing these facts to light.